Apparently size does matter, sometimes. But I digress. WifiAnalyzer doesn’t have the capabilities of some other apps, which may select the best open network and connect you to it automatically. However, I don’t think that’s the point. 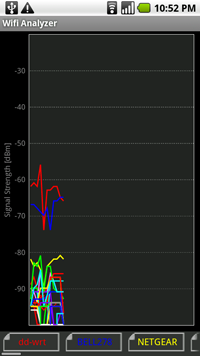 WFA is more for the user who wants to analyze range and power on a comparative scale. And it does it well. 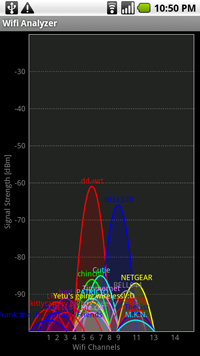 After a quick scan, WFA graphs the signal strength of all the nearby networks, providing different colors and labels for each. 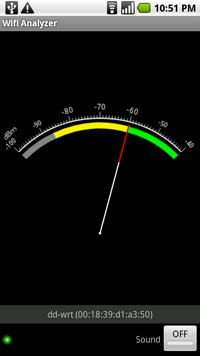 Other readouts include a meter for a single signal, which allows you to walk around and gauge strength by location. There isn’t much to say about hits/misses of this app, because it does exactly what it says on the box: it analyzes your wifi and lets you figure out which of the available signals around you is best for your wireless devices. Other uses include mapping your space for optimal wifi positioning, and finding any “blind spots” that might serve to hamper sharing what you had for lunch on Twitter. I still think someone should rig up a PKE Meter dock, just so we can all pretend we’re Ghostbusters. Matt Demers is a Toronto writer who has gone over his bandwidth cap for the month. He currently writes opinion columns and searches for that idiot who has left their wifi open to torrenting. Wednesday Poll: Why Root your Motorola Droid?